Within every species, a species defined as two living beings which are able to breed and reproduce together, there is individual variation. No two animals, or humans for that matter, are ever exactly alike. Each person is built a little differently and has different influences from their environment. The differences between individuals may be very noticeable, or some not noticeable at all. Parents and children differ in various ways, as well as brothers and sisters. In fact, science has shown that in terms of genetics, 85-95%, or the vast majority of individual genetic variation(differences) happens between members of the same population. An example of this is shown in the California Newsreel and PBS documentary Race – The Power of an Illusion, where African American, White Caucasian, and Latino classmates compare their skin colors, blood types and DNA. While their DNA is being processed, students are asked who they think they are most genetically similar to, and who they think they are least genetically similar to. Most students believed that they would be most similar to other classmates with the same skin color as them: a white student thought he would be most similar to another white student, and least similar to another black student. Similarly, a black student also believed that his genetics would most closely match with those of another black student, and least match with those of another white student. The results surprise the students, as they find that their closest genetic matches are with people who have a different skin color, and they have the most genetic variation with those who have a similar skin color. As the documentary continues, Jamil thought that he would have the fewest mtDNA differences with, and be the most genetically similar to, the student Gorgeous, as they are both African American. The results however taught the students the true meaning of the idea of ‘race’ when it comes to biology and genetics: that there isn’t a connection between the two. “I was more like Kiril than I was than Gorgeous. She has like twelve differences, and like Kiril is like a white, tall, blond…from Russia, and, and, and, like, we seem completely different but it’s less differences,” Jamil said. Jamil, who is ‘racially’ labeled an African American, ended up being more genetically and biologically similar to Kiril, who is ‘racially’ labeled a white caucasian. If human variation were to map along racial lines, people in one so-called race would be more similar to each other than to those in another so-called race. But that’s not what the students found in their mtDNA. Anthropologists and geneticists have spent years gathering data on blood group genes, protein genes, and various other genes from all over the world by taking blood samples from humans from every area of the globe. The data and DNA was then analyzed to see what it told about the differences between human groups, and the findings were a milestone in the study of race and biology. To put it another way, of the small amount of variation in our genes, there is apt to be as much difference between Gorgeous and her teammate Christine, who are both African Americans, as there is between Gorgeous and her opponent Kaylin, who is white caucasian. Any two individuals within any so-called ‘race’ may be as different from each other as they are from any individual in another so-called race. Are the people who we call Black more like each other than they are like people who we call white, genetically speaking? The answer is no. There’s as much or more diversity and genetic difference within any racial group as there is between people of different racial groups. The answer as to why two people with different skin colors can be genetically similar, is that while all humans are evolutionarily genetically similar due to interbreeding and originating from the same human population in Africa just a few thousand years ago, skin color has been able to change in a very short period of evolutionary time. Research by Dr. Nina Jablonski suggests that an estimated time of about 10,000 to 20,000 years is enough for human populations to achieve optimal skin pigmentation in a particular geographic area, based on how much UV radiation(sunlight) there is from the sun, but that development of ideal skin coloration may happen faster if the evolutionary pressure is stronger, even in as little as 100 generations. This means that humans populations consisting of lighter skin colors will adapt to have darker skin when they live in a geographical area with more UV radiation for a period of 10,000 to 20,000 years. 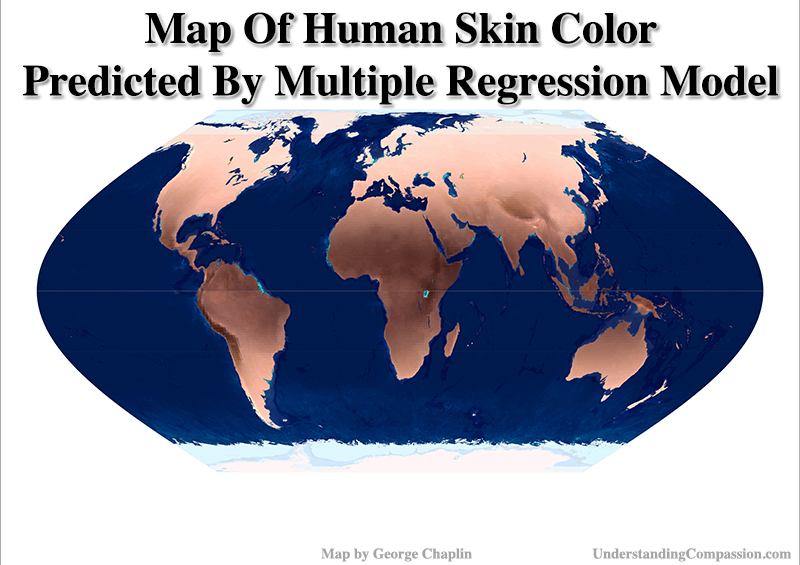 The reverse is also true, as human populations of darker skin colors will adapt to have lighter skin when they live in a geographical area with less UV radiation for a period of 10,000 to 20,000 years. 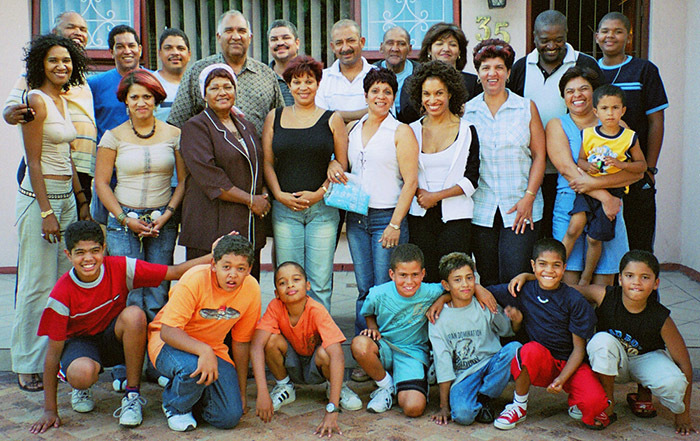 This is a photo of a single family consisting of various tones of skin color. Img Credit: Henry M. Trotter, Creative Commons. The outward appearances of humans vary in terms of height, weight, hair color, hair texture, eye color and skin color. To understand the biology of human variation we examine all of these and their scientific causes, as well as blood type. Height is determined by both genetic factors (60-80%) and environmental factors (20-40%), with the main environmental factor being nutrition. Genetics play a large role in determining the height of individuals, but they are much less influential in regards to height differences among populations. Both wonderfully “tall”, and beautifully “short” people can be found in all areas of the globe. Weight is determined by multiple factors including genetic background, metabolic rate, eating habits and general activity level. Genes can influence a body’s metabolic efficiency, or how efficient the body is at burning calories, but they do not determine what the actual metabolism will be, as lifestyle choices and exercise habits affect the body’s metabolism and also its weight. Hair color is caused by the pigmentation of hair follicles due to two types of melanin; eumelanin and pheomelanin. There is both brown and black eumelanin. High levels of brown eumelanin result in brown hair, while low levels result in blond hair. High levels of black eumelanin result in black hair, and low levels result in white hair. High levels of pheomelanin result in orange and red hair. All humans have both eumelanin and pheomelanin. 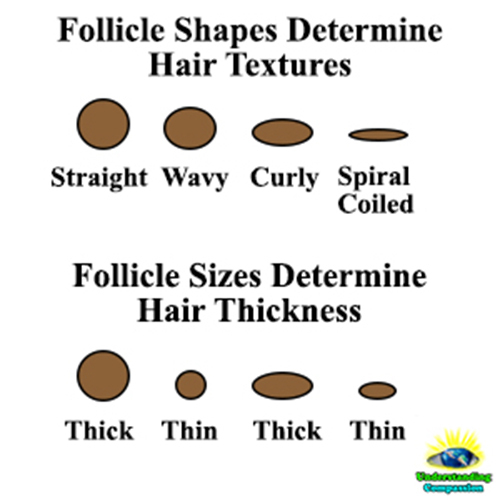 Hair texture and hair thickness is determined by the size and shape of the hair follicle. A 2009 study on the genetics of hair waves and curls reported a heritability of 85-95% (3). Large follicles produce thick hairs, and thin follicles produce thin hairs. Round shaped follicles produce straight hair, oval shaped follicles produce wavy and curly hair, and thin oval shaped follicles produce spiral coiled hair. Eye color is a polygenic trait determined by roughly 16 genes, but it is mostly attributed to two genes on chromosome 15; HERC2 and OCA2. Common eye colors are brown, blue, hazel, green, grey, amber and a combination of colors. It is estimated that 55% of the world’s population have brown eyes. Blood type is a classification of blood that is based on the presence or absence of antibodies and antigens on the surface of red blood cells. Blood types, also called blood groups, are inherited and have contributions from both parents. The four main blood types are A, B, AB and O and can be found in humans in every geographical location around the globe. Skin color is largely determined by the amount of melanin in a human’s skin. Melanin controls and helps regulate the amount of ultraviolet (UV) radiation that penetrates the skin from sunlight. Melanocytes are the cells which produce melanin, and there are two types of melanin they produce; eumelanin and pheomelanin. Eumelanin, which is found in hair and skin, is responsible for the colors black, blond and brown. Pheomelanin has a pink to red hue and is responsible for the red or pink color of lips. According to the Fitzpatrick scale, the human skin color range is; white, light brown, olive, moderate brown, brown, black. An individual’s skin pigmentation is genetically inherited from both parents, and can “tan” or get darker based on ultraviolet (UV) exposure from the sun. Melanin acts as a natural sunscreen by absorbing UV rays. The advantages of dark skin are that it helps to prevent sunburns and skin cancer and protects folic acid from being destroyed by UV light, and the advantages of light skin are that it helps to promote vitamin D synthesis and is associated with lower levels of cholesterol. The disadvantages of dark skin are that it is more difficult to make vitamin D and is associated with higher levels of cholesterol, and the disadvantages of light skin are that UV light breaks down folic acid easier and it is associated with increased levels of sunburns and skin cancer when exposed to UV light. Skin color evolved through natural selection primarily to regulate the amount of UV radiation that penetrates the skin. In fact, ultraviolet radiation is responsible for more than 87% of the variation in human skin color. 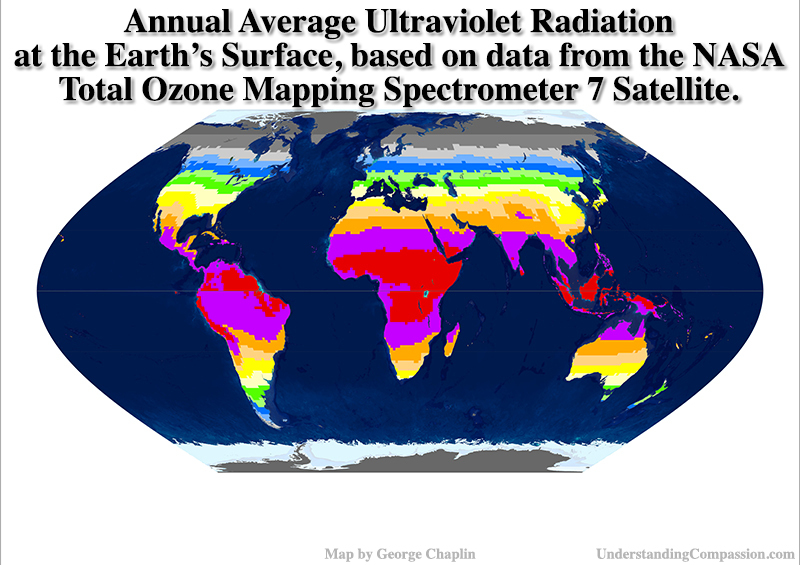 These two world maps show the color variation in human skin colors around the world and the map of annual ultraviolet radiation from the Sun at the Earth’s surface. 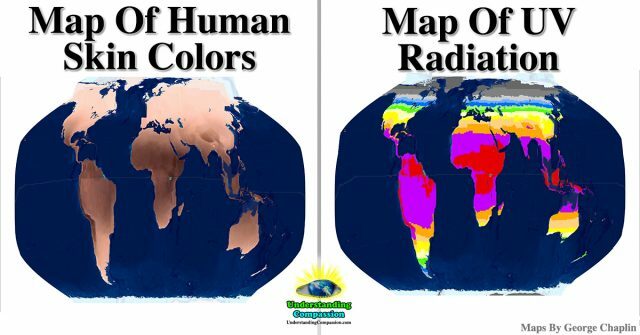 As you can see, humans with darker shades of skin color exist where UV radiation from the Sun is the strongest, and humans with light shades of skin color exist where UV radiation from the Sun is weakest. Researchers have found that most skin color changes occurred very recently; within the last 8,000 to 50,000 years If a population of humans stays put for as little as 1,000 to 8,000 years, skin color begins making changes and adjusting to the optimal pigmentation to protect the body from the sun and from UV radiation; both from dark skin to light skin, and light skin to dark skin. 8,000 years is the blink of an eye in terms of evolution, a very, very short time, and while some very small outwardly visible changes, such as skin color, have taken place, it has not been nearly enough time to develop any considerable differences between any two humans on our planet, regardless of ancestry. Any two humans on Earth will genetically trace back to the same African population that existed roughly 60,000 years ago. The Human Genome Project, which was completed in 2003, had the goal of identifying and mapping out all of the genes of the human genome. The worldwide work from many countries, as well as several top genome sequencers; one being then president of Celera Genomics Craig Venter, helped to complete this massive project of understanding human DNA.